If you plan on sharing a OneNote notebook, either with yourself across your devices or with other people, it’s best to create it on OneDrive right from the start. Moving an existing OneNote notebook into a folder synced by the OneDrive app without going through OneNote is not currently supported. If your organization uses SharePoint, you can share a OneNote notebook on SharePoint instead of OneDrive. 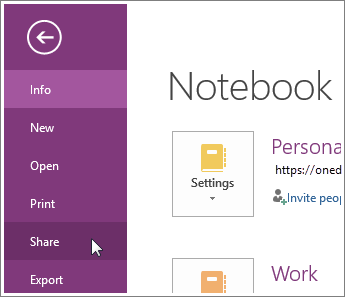 In OneNote 2016 or OneNote 2013, open the notebook that you want to share on OneDrive. Select a location for your notebook, or choose Add a Place and then sign into your OneDrive account. If you don’t already have one, you can sign up for free. Enter a name for your notebook (if you like, you can keep the name it already has), and then choose Move Notebook. After you see the location in the list, select it. Important: If you are moving a local notebook to OneDrive as part of a OneDrive Known Folder Move, be sure to remove the original copy from the Desktop, Pictures, or Documents folder to finish the Known Folder Move protection process after the notebook is successfully moved to OneDrive. After you’ve successfully moved a notebook to OneDrive, you can share it with others by clicking File > Share > Share with People (in OneNote 2016) or clicking File > Share > Invite People (in OneNote 2013). This lets you send an email message with a link to your shared notebook to the people you select. Depending on the notebook permissions you’ve set on OneDrive, recipients will be able to either view or modify your notes at the shared location.